The OVERKILL command can be used to clean up your drawing by combining connected co-linear objects, optimizing polylines and segments AND remove duplicate geometry. This tool can be accessed from the ribbon or from the command line. 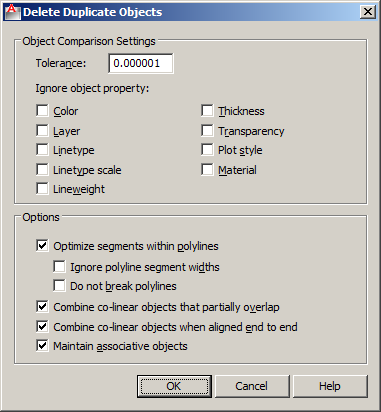 The properties and actions options are all controlled through the dialog box by setting tolerance precision, which if any object properties to ignore, and how to deal with polyline segments and co-linear objects. It’s been a life saver for me especially when cleaning my 2D dwg files to remove redundant geometry, unwanted duplicate copies of objects, arcs drawn over portions of circles etc. Very good tool.